A national referendum in Ecuador this Sunday appears likely to give a boost to President Lenín Moreno in his political struggle against his predecessor, Rafael Correa (2007-2017). The central item on the seven-question ballot will be whether or not presidential term limits should be reinstated into the Constitution – an initiative that Correa, who would like to run for a fourth term in 2021, is campaigning against. The country appears poised to move on from the thrice-elected yet polarizing Correa to the more conciliatory Moreno; at the time of writing, citizens resoundingly endorse all seven referendum questions, with no question polling lower than 66 percent approval. A “yes” vote on term limits would end Correa’s future presidential aspirations and position Moreno – Correa’s hand-picked successor – as the standard bearer of the political left in Ecuador. The feud between Moreno and Correa – and within their ruling Alianza PAIS (AP) party – has been building for nearly a year and a half. Last November, one of Moreno’s closest advisors, Eduardo Mangas, alleged in a leaked recording that Correa hoped Moreno would lose the election. Correa purportedly provided no logistical or financial support for his chosen successor while saddling him with the deeply unpopular Jorge Glas as running mate. According to Mangas, Correa preferred that AP lose the presidential election and instead govern through its control of the vast state bureaucracy and National Assembly – with Correa returning to the presidency in 2021. Eking out a narrow victory (51.6 percent against Guillermo Lasso’s 48.8 percent), Moreno upended this plan. Moreno took office facing a polarized political environment and daunting fiscal deficit and weak GDP, but his sound policies and astute political strategy have given him the highest approval ratings in Latin America. His focus on the popular valence issues of corruption and re-election – about which citizens will usually share a common preference regardless of ideology – has also helped distract voters from the tepid economy. The referendum is a particularly smart gambit. It proposes seven different changes that would reverse actions taken during Correa’s rule – and that happen to enjoy broad popular support. Instead of trying to push them through established institutional channels staffed with correistas, like the National Assembly or the courts, the President is turning directly to the public to give the measures legality. Absent any bombshell announcements or drastic changes in public opinion, Moreno looks set to coast to victory in the referendum, quite remarkably establishing him as the country’s most powerful politician. However, he faces a number of challenges to governance over the remainder of his four-year term. The defection of Correa and his faction from Alianza PAIS left him with only 46 seats in the 137-member National Assembly. This means Moreno’s bloc will continue to depend on ephemeral voting alliances with the center-right to govern – exactly like much of the 1979-2006 period when no popularly elected president finished his term. Moreover, after 2.7 percent GDP growth in 2017, the IMF predicts that Ecuador’s economy – vulnerable because of its dependence on oil exports – will grow by only 2.2 percent in 2018 and 1.7 percent in 2019. Moreno should enjoy his victory on Sunday, but he will soon face challenges greater than Rafael Correa: long-term governance in a country that has long proven averse it. Whether he is up to the challenge remains to be seen, although he has so far proven resourceful. In the 11 years since he was first elected president of Bolivia, Evo Morales has delivered remarkable stability and progress even though his drive for power still concerns many opponents. Along with Venezuela’s Hugo Chávez and Ecuador’s Rafael Correa, he was labelled by some observers as part of the “irresponsible” or “populist” left – in contrast to more “social democratic” leftists like Brazil’s Lula da Silva or Chile’s Michelle Bachelet. The “populists” were also widely criticized for weakening and playing loose with democratic institutions and for authoritarian practices associated with the region’s caudillo legacy. But Morales’ course has neither followed Venezuela’s, whose populist regime lies in ruins with no clear exit strategy; nor Ecuador’s, which looks set to accept a peaceful transition of power to the opposition later this year. Bolivia appears to have reached a sort of political equilibrium. Despite charged economic rhetoric and his championing of leftist socioeconomic policies, Morales has pursued prudent, conservative macroeconomic policies. Bolivia has carefully increased its reserves from a little over $3 billion in 2006 to more than $15 billion by 2014. As of 2015 reserves amounted to 40 percent of GDP. At the same time, the GDP has grown from just over $8 billion in 2000 to nearly $33 billion by 2015, with GDP per capita (PPP) nearly doubling from $3,497 to $6,954 in the same time span. Morales’s signature socioeconomic reforms borrow from the “responsible” leftist models, rather than the vertical chavista model. He has created cash transfer programs similar to those used successfully in Mexico and Brazil. These bonos, including some created by Gonzalo Sánchez de Lozada, provide unconditional cash for pensions, pre- and post-natal care, and education. While this spending pales in comparison to “megaprojects” such as highways and soccer stadiums, it goes directly to Bolivian households – with obvious political benefit for the Morales government and clear, direct benefits to average Bolivians. The new constitution adopted in 2009 – a product of compromise between Morales and the regionalist opposition – radically decentralized state structure, satisfying opponents’ desire for significant space at the local level. The eastern lowland regionalist opposition can regularly count on winning governorships in Santa Cruz, Beni, and Tarija, while middle-class, liberal opponents win in the major cities of La Paz, Cochabamba, Potosí, and now even El Alto. This diffuses political conflicts and prevents the consolidation of unified opposition. Conflict between the central state and regionalists continues, but it has become routinized and therefore has stabilized. The electoral court, elevated to be a “branch” of government in the 2009 constitution, has remained largely impartial, maintained its political independence, and significantly improved its capabilities – increasing Bolivians’ trust in the legitimacy of elections. A referendum last year, rejecting a constitutional reform that would allow Morales to run for another term in 2019, was managed competently and (for the most part) fairly. Not all is well, however. Despite losing the referendum, Morales and his MAS party made clear that he intends to find a way to run for reelection yet again in 2019. The opposition’s concerns about his authoritarian tendencies are not wholly exaggerated. Indeed, the government frequently lashes out at its perceived enemies in ways that go well beyond the niceties of democratic adversarial politics. Likewise, there are clear signs that corruption remains deeply rooted within the government. But none of this contradicts what seems obvious: The MAS government has brought relative prosperity and stability – even fueling optimism that if (or when) it steps down, its transition may be more like the one that Ecuador appears likely to experience later this year than the meltdown that is tearing apart Venezuela. * Miguel Centellas teaches political sociology at the University of Mississippi’s Croft Institute for International Studies and has written extensively on Bolivian electoral and subnational politics. He also co-directs an interdisciplinary summer field school based in La Paz. The surprising emergence of the Frente Amplio (FA), a coalition of political parties, social organizations and independent activists, in Peru’s recent presidential and congressional elections signals the first significant support for the Peruvian Left since the collapse of the Izquierda Unida in the 1980s. The Left was not able to present its own alternatives in the ‘90s, the early 2000s, and again in 2011. In October 2015 barely 13 percent of Peruvians knew about FA’s internal election to select presidential candidates. Veronika Mendoza had the support of only 1 percent of intending voters, and over 60 percent of Peruvians did not even know who she was. Nevertheless, FA ended up receiving 18.74 percent of the vote in the first electoral round, coming in third and only a couple of points behind Pedro Pablo Kuczynski (PPK), who secured 21.05 percent and ended up defeating the Fuerza Popular’s candidate, Keiko Fujimori, to become President for the 2016-2021 period. FA’s “post-extractivist” program has been key. Breaking away from the nationalist redistributive programs of leftists in Venezuela, Ecuador, Bolivia, Brazil, and Argentina, FA espouses economic diversification and tax reform rather than more mineral or hydrocarbon exports to sustain economic growth and public incomes. FA also emphasizes the need to protect the environment and renewable natural resources for future generations and to recognize indigenous rights to territories, autonomy, direct political representation and effective consultations. These are not only electoral campaign ideas. Indeed, FA local activists and national leaders have maintained staunch opposition to emblematic mining projects such as the Conga project in the northern Cajamarca region and the Tía María project in southern Arequipa. In the same way, FA is denouncing that the new government is trying to lower air quality environmental standards to ease foreign investments in mineral smelters and has harshly criticized the new Minister of Production for abandoning the National Plan for Productive Diversification launched by the outgoing Ollanta Humala administration. Frente Amplio is grounded in social movements that have long confronted extractivist projects. Veronika Mendoza left President Humala’s Nationalist Party in 2012 in a dispute over his repressive response to socio-environmental protests around mining projects in the highlands of her native Cusco. Tierra y Libertad, FA’s largest party, has its roots in the Cajamarca rondas campesinas resistance against the Conga project. Another factor is that the end of the commodities “super cycle” has moved extractive rents off center stage. Even in Venezuela the official discourse is now moving in the direction of economic diversification. Frente Amplio is not alone in Latin America in attempting to build a post–extractivist platform, but it seems to be the region’s most successful. Similar policies were at the heart of the presidential campaign of Alberto Acosta and a coalition of social and indigenous organizations in Ecuador. And in El Salvador, the Farabundo Martí government is also keeping extractivist temptations at bay. But Acosta did not manage to get significant support or to build a stable political alternative, and El Salvador is not a major commodity exporter. The importance of the FA experience is that it happens in a significant mineral and gas producer, that it has had immediate electoral success, and that it can become a permanent political player in Peruvian democracy. FA and PPK will probably agree on issues such as the fight against corruption, crime, and violence against women, but they will certainly disagree over macroeconomic and sector policies, such as taxes. Also, FA has denounced PPK for his call to lower air pollution standards and for his authorization to large fishing factories to operate up to 5 km off the coast, leaving very little for artisanal, small scale, internal market-oriented fishing activities. Where this ends up is anybody’s guess, but this is certainly a process worth keeping an eye on. *Carlos Monge is Latin America regional director at the Natural Resource Governance Institute in Lima. Elections in Uruguay: A Bellwether for the Latin American Left? Uruguay’s elections on October 26 – once seen as a sure bet for the ruling Frente Amplio’s presidential candidate, former president Tabaré Vázquez (2005-2010) – have become a tight race, perhaps signaling challenges for other left-leaning Latin American governments as well. 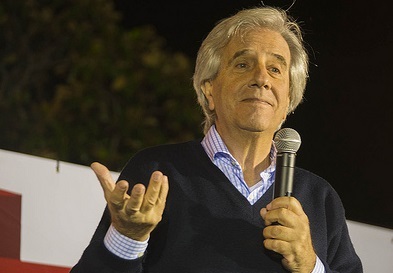 The FA’s slight slip in the polls since the beginning of 2014 has been matched by sustained growth by the Partido Nacional, led by Luis Lacalle Pou, the son of a former president. While Vázquez still holds a ten-point lead, he’s well below the absolute majority needed to avoid a run-off election, whose numbers look even bleaker for the ruling party. In February, Lacalle Pou was running twenty-five points behind Vázquez in a head-to-head matchup, but the latest polls now show him only two points back. Lacalle Pou will need the support of his party’s long-time rival, the Colorado Party, to win a second round against the FA, but Colorado candidate Pedro Bordaberry has thus far refused to concede the first round to the PN despite trailing them by 17 points. Nonetheless, Vázquez was defeated by just such a second-round alliance in 1999. Complicating things for him, polling strongly suggests that FA could lose control of both houses of the national legislature this fall. The Lacalle Pou campaign has focused on public security and education. Uruguay’s homicide rate remains one of the lowest in the region, but a modest increase in crime in recent years has spurred both urban and rural Uruguayans to rank security as the principal problem facing the nation – well ahead of the second leading concern, education. The October elections will coincide with a referendum on lowering the age of criminal responsibility from 18 to 16 for serious offensives, with polls showing Uruguayans closely divided but leaning toward approval. On the education front, the FA’s Plan Ceiba has helped provide laptops to every student, but 2012 assessment data from the Organization for Economic Cooperation and Development still place Uruguay’s students well below the international average in math, science, and reading. The FA’s political situation is paradoxical: it has presided over major socioeconomic improvements in the last decade and won international acclaim, but earned a more tepid response at home. Uruguay’s decision to legalize marijuana was widely celebrated abroad as a step toward a more progressive drug policy in the region, but polls continue to show that a majority of Uruguayans oppose legalization, and it has not won the FA much support even among proponents of cannabis, who have resisted the creation of a registry of buyers. (Vázquez recently suggested the registry would be used to develop rehabilitation programs.) The FA seems to have not yet figured out how to respond effectively to the perception of insecurity, nor has it overseen a decided improvement in education, which is central to long-term development prospects. With Brazil’s Partido dos Trabalhadores facing an uncertain future, and political crises in Argentina and Venezuela simmering, the FA may be the first case of a larger regional rollback of the first wave of 21st century leftwing movements.